The James. M. Parks Fitness Center at Kilgore College is committed to providing the best fitness facility in East Texas. Our superior staff and state-of-the-art equipment will meet and exceed all of your expectations. Parks Fitness Center (PFC) at Kilgore College is a full-service workout and fitness facility on the campus in Kilgore. PFC offers the only complete fitness center in the city, including machine weights, dedicated cardio area, free weights area, indoor walking track, full-size aerobics floor, racquetball courts and a carpeted basketball gymnasium. Locker rooms and showers are also available, providing private areas for members to change before and after a workout. A wide variety of daily and weekly fitness classes are offered at the facility, all of which are free of charge to members. 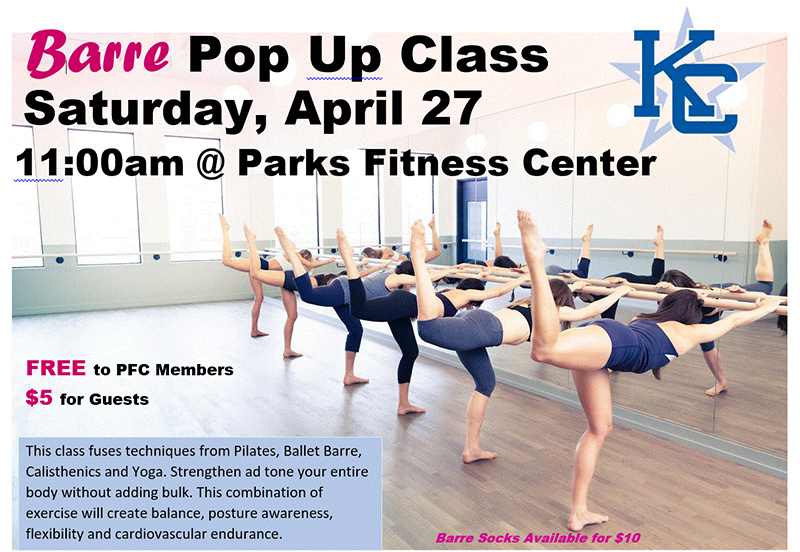 NOTE: PFC members also get fitness facility rental discounts of 20% for parties and events. Step: A great cardiovascular workout with different combinations on the step, starting off easy and progressing to a more difficult level. Fun for everyone! Muscle Pump: This class targets every muscle group for leaner muscle mass and fat burn. Be stronger, have more endurance and better muscle tone. The class uses free weights and resistance band training and targets upper and lower body abdominals. HIIT: This class alternates short intervals of high-intensity cardio with less intense recovery periods. Burn more fat, improve your endurance and build strength in a fraction of the time. Kickboxing: This class is explosive and energetic, giving you powerful punches and kicks to music. Kickboxing gives you an overall conditioning of the body using boxing techniques and martial arts. This class can be challenging but allows you to work at your own pace. Cardio Pump: This class combines intervals of cardio and strength training for a great comprehensive one-hour workout. Cycling: Experience a total-body workout on an indoor stationary bike while completing an instructor-designed course of sprints, hills and flat roads. Silver Circuit: A 30-minute circuit training workout specifically designed for our senior population. Zumba: A cardio dance workout to a mix of Latin music. Personal Trainers are available for hire at Parks Fitness Center. Personal Trainers are not employed by or agents of Kilgore College or Parks Fitness Center. In order to be trained in our facility you must have a current membership. Trainers who are accepting new clients leave their business cards and contact information at the front desk. All financial transactions for training take place between the individual client and their trainer and in no way involve Parks Fitness Center or Kilgore College. Group Exercise: Aerobics is one of the most popular and beneficial forms of exercise. Parks Fitness Center offers a wide variety of classes ranging from water aerobics to kick boxing. Basketball/Volleyball: A carpeted gym allows for basketball or volleyball year around. Pick-up games are available at various times. Indoor Walking/Running Track: Parks Fitness Center offers a shock absorbing oval walking/running track for less impact during your workouts. The track is 1/14th of a mile (14 laps = one mile). Tennis: The four courts are lighted for night play. Weight Training: The Parks Fitness Center houses one of the largest weight rooms in East Texas. In addition to a free-weight area there is a 17-station Cybex VR/3area that allows for a complete body workout. Racquetball: Three racquetball courts are available. Racquetballs and racquets are available at the front desk. Cardiovascular Area: A cardiovascular area enables users to exercise on various types of equipment including "Elliptical " trainers, treadmills, stair steppers, air dyne bikes, recumbent bikes, etc. Indoor Cycling Room: An exciting new addition to Parks Fitness Center is the indoor cycling room. Cycling classes are offered on Tuesdays and Thursdays and are open to the public. Guest passes: Members are allowed four complimentary guests per year (must be registered at front desk). Non-members pay $5 per visit. Liability: Parks Fitness Center will assume no responsibility for lost or stolen items or for accident or injury of any nature. All members, non-members, and guests must check in at the front desk. No food or drinks allowed past the lobby area. All patrons must wear shirts and tennis shoes at all times while in the fitness center. Children must be at least 13 years old to use cardiovascular equipment and 15 years old to be in the weight training area. Those age 15 and under must be accompanied by an adult at all times.